This article is about the Habsburg realm between 1804 and 1867. For the Habsburg realms more generally, see Habsburg Monarchy. For the Habsburg realm between 1867 and 1918, see Austria-Hungary. The Austrian Empire (Austrian German: Kaiserthum Oesterreich, modern spelling Kaisertum Österreich) was a Central European multinational great power from 1804 to 1867, created by proclamation out of the realms of the Habsburgs. During its existence, it was the third most populous empire after the Russian Empire and the United Kingdom in Europe. Along with Prussia, it was one of the two major powers of the German Confederation. Geographically, it was the third largest empire in Europe after the Russian Empire and the First French Empire (621,538 square kilometres; 239,977 sq mi). Proclaimed in response to the First French Empire, it partially overlapped with the Holy Roman Empire until the latter's dissolution in 1806. 1: Territories of Austria and Bohemia only. The Kingdom of Hungary – as Regnum Independens – was administered by its own institutions separately from the rest of the empire. After Austria was defeated in the Austro-Prussian War of 1866, the Austro-Hungarian Compromise of 1867 was adopted, joining together the Kingdom of Hungary and the Empire of Austria to form Austria-Hungary. The power of nationalism to create new states was irresistible in the 19th century, and the process could lead to collapse in the absence of a strong nationalism. The Austrian Empire had the advantage of size, but multiple disadvantages. There were rivals on four sides, its finances were unstable, the population was fragmented into multiple ethnicities and languages that served as the bases for separatist nationalism. It had a large army with good forts, but its industrial base was thin. Its naval resources were so minimal that it did not attempt to build an overseas empire. It did have the advantage of good diplomats, typified by Metternich (foreign minister 1809–1848, prime minister 1821–1848). They employed a grand strategy for survival that balanced out different forces, set up buffer zones, and kept the Habsburg empire going despite wars with the Ottomans, Frederick the Great, Napoleon and Bismarck, until the final disaster of the First World War. The Empire overnight disintegrated into multiple states based on nationalism. Changes shaping the nature of the Holy Roman Empire took place during conferences in Rastatt (1797–1799) and Regensburg (1801–1803). On 24 March 1803, the Imperial Recess (German: Reichsdeputationshauptschluss) was declared, which reduced the number of ecclesiastical states from 81 to only 3 and the free imperial cities from 51 to 6. This measure was aimed at replacing the old constitution of the Holy Roman Empire, but the actual consequence of the Imperial Recess was the end of the empire. Taking this significant change into consideration, the Holy Roman Emperor Francis II created the title Emperor of Austria, for himself and his successors. In 1804, the Holy Roman Emperor Francis II, who was also ruler of the lands of the Habsburg Monarchy, founded the Empire of Austria, in which all his lands were included. In doing so he created a formal overarching structure for the Habsburg Monarchy, which had functioned as a composite monarchy for about three hundred years. He did so because he foresaw either the end of the Holy Roman Empire, or the eventual accession as Holy Roman Emperor of Napoleon, who had earlier that year adopted the title of an Emperor of the French; Francis II eventually abandoned the title of German-Roman Emperor later in 1806. To safeguard his dynasty's imperial status he adopted the additional hereditary title of Emperor of Austria. Apart from now being included in a new "Kaiserthum", the workings of the overarching structure and the status of its component lands at first stayed much the same as they had been under the composite monarchy that existed before 1804. This was especially demonstrated by the status of the Kingdom of Hungary, a country that had never been a part of the Holy Roman Empire and which had always been considered a separate realm—a status that was affirmed by Article X, which was added to Hungary's constitution in 1790 during the phase of the composite monarchy and described the state as a Regnum Independens. Hungary's affairs remained administered by its own institutions (King and Diet) as they had been beforehand. Thus no Imperial institutions were involved in its government. The fall and dissolution of the Holy Roman Empire was accelerated by French intervention in the Empire in September 1805. On 20 October 1805, an Austrian army led by General Karl Mack von Leiberich was defeated by French armies near the town of Ulm. The French victory resulted in the capture of 20,000 Austrian soldiers and many cannons. Napoleon's army won another victory at Austerlitz on 2 December 1805. Francis was forced into negotiations with the French from 4 to 6 December 1805, which concluded with an armistice on 6 December 1805. The French victories encouraged rulers of certain imperial territories to ally themselves with the French and assert their formal independence from the Empire. On 10 December 1805, Maximilian IV Joseph, the prince-elector and Duke of Bavaria, proclaimed himself King, followed by the Duke of Württemberg Frederick III on 11 December. Charles Frederick, Margrave of Baden, was given the title of Grand Duke on 12 December. Each of these new states became French allies. The Treaty of Pressburg between France and Austria, signed in Pressburg (today Bratislava, Slovakia) on 26 December, enlarged the territory of Napoleon's German allies at the expense of defeated Austria. Francis II agreed to the humiliating Treaty of Pressburg (26 December 1805), which in practice meant the dissolution of the long-lived Holy Roman Empire and a reorganization under a Napoleonic imprint of the German territories lost in the process into a precursor state of what became modern Germany, those possessions nominally having been part of the Holy Roman Empire within the present boundaries of Germany, as well as other measures weakening Austria and the Habsburgs in other ways. Certain Austrian holdings in Germany were passed to French allies—the King of Bavaria, the King of Württemberg and the Elector of Baden. Austrian claims on those German states were renounced without exception. On 12 July 1806, the Confederation of the Rhine was established, comprising 16 sovereigns and countries. This confederation, under French influence, put an end to the Holy Roman Empire. On 6 August 1806, even Francis recognized the new state of things and proclaimed the dissolution of the Holy Roman Empire, as he did not want Napoleon to succeed him. This action was unrecognized by George III of the United Kingdom who was also the Elector of Hanover and had also lost his German territories around Hanover to Napoleon. His claims were later settled by the creation of the Kingdom of Hanover which was held by George's British heirs until Queen Victoria's accession, when it split into the British and Hanoverian royal families. Klemens von Metternich became Foreign Minister in 1809. He also held the post of Chancellor of State from 1821 until 1848, under both Francis II and his son Ferdinand I. The period of 1815-1848 is also referred to as the "Age of Metternich". During this period, Metternich controlled the Habsburg Monarchy's foreign policy. He also had a major influence in European politics. He was known for his strong conservative views and approach in politics. Metternich's policies were strongly against revolution and liberalism. In his opinion, liberalism was a form of legalized revolution. Metternich believed that absolute monarchy was the only proper system of government. This notion influenced his anti-revolutionary policy to ensure the continuation of the Habsburg monarchy in Europe. Metternich was a practitioner of balance-of-power diplomacy. His foreign policy aimed to maintain international political equilibrium to preserve the Habsburgs' power and influence in international affairs. Following the Napoleonic Wars, Metternich was the chief architect of the Congress of Vienna in 1815. The Austrian Empire was the main beneficiary from the Congress of Vienna and it established an alliance with Britain, Prussia, and Russia forming the Quadruple Alliance. The Austrian Empire also gained new territories from the Congress of Vienna, and its influence expanded to the north through the German Confederation and also into Italy. Due to the Congress of Vienna in 1815, Austria was the leading member of the German Confederation. Following the Congress, the major European powers agreed to meet and discuss resolutions in the event of future disputes or revolutions. Because of Metternich's main role in the architecture of the Congress, these meetings are also referred to as the "Metternich congress" or "Metternich system". While Metternich was the Austrian foreign minister, other congresses would meet to resolve European foreign affairs. These included the Congresses of Aix-la-Chapelle (1818), Carlsbad (1819), Troppau (1820), Laibach (1821), and Verona (1822). The Metternich congresses aimed to maintain the political equilibrium among the European powers and prevent revolutionary efforts. These meetings also aimed to resolve foreign issues and disputes without resorting to violence. By means of these meetings and by allying the Austrian Empire with other European powers whose monarchs had a similar interest in preserving conservative political direction, Metternich was able to establish the Austrian Empire's influence on European politics. Also, because Metternich used the fear of revolutions among European powers, which he also shared, he was able to establish security and predominance of the Habsburgs in Europe. Under Metternich, nationalist revolts in Austrian north Italy and the German states were forcibly crushed. At home, he pursued a similar policy to suppress revolutionary and liberal ideals. He employed the Carlsbad Decrees of 1819, which used strict censorship of education, press and speech to repress revolutionary and liberal concepts. Metternich also used a wide-ranging spy network to dampen down unrest. Metternich operated very freely with regard to foreign policy under Emperor Francis II's reign. Francis died in 1835. This date marks the decline of Metternich's influence in the Austrian Empire. Francis' heir was his son Ferdinand I, but he suffered from an intellectual disability. Ferdinand's accession preserved the Habsburg dynastic succession, but he was not capable of ruling. The leadership of the Austrian Empire was transferred to a state council composed of Metternich, Francis II's brother Archduke Louis, and Count Franz Anton Kolowrat, who later became the first Minister-President of the Austrian Empire. The liberal Revolutions of 1848 in the Austrian Empire forced Metternich's resignation. Metternich is remembered for his success in maintaining the status quo and the Habsburg influence in international affairs. No Habsburg foreign minister following Metternich held a similar position within the empire for such a long time nor held such a vast influence on European foreign affairs. Historians often remember the Metternich era as a period of stagnation: the Austrian Empire fought no wars nor did it undergo any radical internal reforms. However, it was also thought of as a period of economic growth and prosperity in the Austrian Empire. The population of Austria rose to 37.5 million by 1843. Urban expansion also occurred and the population of Vienna reached 400,000. During the Metternich era, the Austrian Empire also maintained a stable economy and reached an almost balanced budget, despite having a major deficit following the Napoleonic Wars. From March 1848 through November 1849, the Empire was threatened by revolutionary movements, most of which were of a nationalist character. Besides that, liberal and even socialist currents resisted the empire's longstanding conservatism. Ultimately, the revolutions failed, in part because the various revolutionaries had conflicting goals. After the death of Prince Felix of Schwarzenberg in 1852, the Minister of the Interior Baron Alexander von Bach largely dictated policy in Austria and Hungary. Bach centralized administrative authority for the Austrian Empire, but he also endorsed reactionary policies that reduced freedom of the press and abandoned public trials. He later represented the Absolutist (or Klerikalabsolutist) direction, which culminated in the concordat of August 1855 that gave the Roman Catholic Church control over education and family life. This period in the history of the Austrian Empire would become known as the era of neo-absolutism, or Bach's absolutism. The pillars of the so-called Bach system (Bachsches System) were, in the words of Adolf Fischhof, four "armies": a standing army of soldiers, a sitting army of office holders, a kneeling army of priests and a fawning army of sneaks. Prisons were full of political prisoners: for example during his administration, Czech nationalist journalist and writer Karel Havlíček Borovský was forcibly expatriated (1851–1855) to Brixen. This exile undermined Borovský's health and he died soon afterwards. This affair earned Bach a very bad reputation amongst Czechs and subsequently led to the strengthening of the Czech national movement. However, Bach's relaxed ideological views (apart from the neo-absolutism) led to a great rise in the 1850s of economic freedom. Internal customs duties were abolished, and peasants were emancipated from their feudal obligations. In her capacity as leader of the German Confederation, Austria participated with volunteers in the First War of Schleswig (1848–1850). Sardinia allied itself with France for the conquest of Lombardy–Venetia. Austria was defeated in the 1859 armed conflict. The Treaties of Villafranca and Zürich removed Lombardy, except for the part east of the Mincio river, the so-called Mantovano. The Constitution of 1861 created a House of Lords (Herrenhaus) and a House of Deputies (Abgeordnetenhaus). But most nationalities of the monarchy remained dissatisfied. After the second war with Denmark in 1864, Holstein came under Austrian, Schleswig and Lauenburg under Prussian administration. But the internal difficulties continued. Diets replaced the parliament in 17 provinces, the Hungarians pressed for autonomy, and Venetia was attracted by the now unified Italy. After Austria was defeated in the Austro-Prussian War of 1866 and the German Confederation was dissolved, the Austro-Hungarian Compromise of 1867 was adopted. 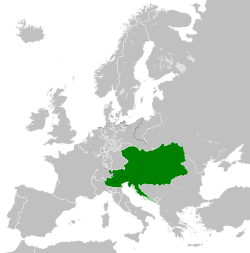 By this act, the Kingdom of Hungary and the Empire of Austria as two separate entities joined together on an equal basis to form the Dual Monarchy of Austria-Hungary. The frequent abbreviation K.u.K. (Kaiserliche und Königliche, "Imperial and Royal") does not refer to that dual monarchy but originated in 1745, when the "royal" part referred to the Apostolic Kingdom of Hungary. The Napoleonic Wars dominated Austrian foreign policy from 1804 to 1815. The Austrian army was one of the most formidable forces the French had to face. After Prussia signed a peace treaty with France on 5 April 1795, Austria was forced to carry the main burden of war with Napoleonic France for almost ten years. This severely overburdened the Austrian economy, making the war greatly unpopular. Emperor Francis II therefore refused to join any further war against Napoleon for a long time. On the other hand, Francis II continued to intrigue for the possibility of revenge against France, entering into a secret military agreement with the Russian Empire in November 1804. This convention was to assure mutual cooperation in the case of a new war against France. Austrian unwillingness to join the Third Coalition was overcome by British subsidies, but the Austrians withdrew from the war yet again after a decisive defeat at the Battle of Austerlitz. Although the Austrian budget suffered from wartime expenditures and its international position was significantly undermined, the humiliating Treaty of Pressburg provided plenty of time to strengthen the army and economy. Moreover, the ambitious Archduke Charles and Johann Philipp von Stadion never abandoned the goal of further war with France. The Austrian Empire in 1812. Archduke Charles of Austria served as the Head of the Council of War and Commander in Chief of the Austrian army. Endowed with the enlarged powers, he reformed the Austrian Army to preparedness for another war. Johann Philipp von Stadion, the foreign minister, personally hated Napoleon due to an experience of confiscation of his possessions in France by Napoleon. In addition, the third wife of Francis II, Maria Ludovika of Austria-Este, agreed with Stadion's efforts to begin a new war. Klemens Wenzel von Metternich, located in Paris, called for careful advance in the case of the war against France. The defeat of French army at the Battle of Bailén in Spain on 27 July 1808 triggered the war. On 9 April 1809, an Austrian force of 170,000 men attacked Bavaria. 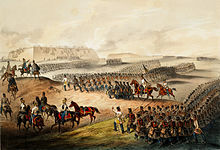 Despite military defeats—especially the Battles of Marengo, Ulm, Austerlitz and Wagram—and consequently lost territory throughout the Revolutionary and Napoleonic Wars (the Treaties of Campo Formio in 1797, Luneville in 1801, Pressburg in 1806, and Schönbrunn in 1809), Austria played a decisive part in the overthrow of Napoleon in the campaigns of 1813–14. It participated (though modestly) in a second invasion of France in 1815, and put an end to Murat's regime in south Italy. The latter period of Napoleonic Wars featured Metternich exerting a large degree of influence over foreign policy in the Austrian Empire, a matter nominally decided by the Emperor. Metternich initially supported an alliance with France, arranging the marriage between Napoleon and the Francis II's daughter, Marie-Louise; however, by the 1812 campaign, he had realised the inevitability of Napoleon's downfall and took Austria to war against France. Metternich's influence at the Congress of Vienna was remarkable, and he became not only the premier statesman in Europe but the virtual ruler of the Empire until 1848—the Year of Revolutions—and the rise of liberalism equated to his political downfall. The result was that the Austrian Empire was seen as one of the great powers after 1815, but also as a reactionary force and an obstacle to national aspirations in Italy and Germany. The Austrian Empire, between 1816 and 1867. Ethnographic composition of the Austrian Empire (1855). ^ A. Wess Mitchell (2018). The Grand Strategy of the Habsburg Empire. Princeton University Press. p. 307. ^ a b c d e Sked, Alan. The Decline and Fall of the Habsburg Empire, 1815-1918. London: Longman, 1989. Print. ^ a b c d e f g Jelavich, Barbara. The Habsburg Empire in European Affairs: 1814-1918. Chicago: Rand Mcnally, 1969. Print. ^ Tuncer, Huner. "Metternich and the Modern Era." ARTS-CULTURE -. Daily News, 6 Sept. 1996. Web. 24 Mar. 2015. ^ a b Sofka, James R. "Metternich's Theory of European Order: A Political Agenda for 'Perpetual Peace'." The Review of Politics 60.01 (1998): 115. Web. ^ a b Handbook of Austria and Lombardy-Venetia Cancellations on the Postage Stamp Issues 1850–1864, by Edwin MUELLER, 1961. ^ a b Crankshaw, Edward. The Fall of the House of Habsburg. New York: Viking, 1963. Print. ^ "History of Austria, Austria in the Age of Metternich." History of Austria, Austria in the Age of Metternich. N.p., n.d. Web. 24 Mar. 2015. Gilman, D. C.; Peck, H. T.; Colby, F. M., eds. (1905). "Bach, Alexander, Baron" . New International Encyclopedia (1st ed.). New York: Dodd, Mead. ^ Mueller 1961, Historical Data, p.H5. ^ Gunther Rothenberg, Napoleon's great adversaries: the Archduke Charles and the Austrian army, 1792-1814 (Indiana UP, 1982). ^ Robert Goetz, 1805, Austerlitz: Napoleon and the Destruction of the Third Coalition (2005). ^ Josephine Bunch Stearns, The Role of Metternich in Undermining Napoleon (University of Illinois Press, 1948). Kann, Robert A. (1980). A History of the Habsburg Empire, 1526–1918 (2nd ed.). Kissinger, Henry (1955). The World Restored: Metternich, Castlereagh, and the Problems of Peace, 1812–22. Rothenberg, Gunther E. (1976). "Nobility and Military Careers: The Habsburg Officer Corps, 1740–1914". Military Affairs. 40 (4): 182–186. doi:10.2307/1986702. JSTOR 1986702. Rothenberg, Gunther E. (1968). "The Austrian Army in the Age of Metternich". Journal of Modern History. 40 (2): 155–165. doi:10.1086/240187. JSTOR 1876727. Sked, Alan (2008). Metternich and Austria: An Evaluation. Sked, Alan (2001). The Decline and Fall of the Habsburg Empire, 1815–1918 (2nd ed.). Wikimedia Commons has media related to Austrian Empire.